To Cite: Rafati L, Ehrampoush M H, Mokhtari M, Sohrabi A, Shirazi S, et al. The Analysis of Oxytetracycline Residue in Tissues of Cultured Rainbow Trout (Oncorhynchus Mykiss), Health Scope. 2018 ; 7(2):e57495. doi: 10.5812/jhealthscope.57495. Background: Oxytetracycline (OTC) is commonly used in aquaculture industry and has high potency against bacterial diseases. Objectives: The present study aimed at examining the rate of oxytetracycline (OTC) antibiotic residue in the tissues of cultured rainbow trout (Oncorhynchus mykiss). Methods: Samples were taken randomly from the livers and fillets of 45 rainbow trout from 15 large aquaculture ponds in Hamadan province, West of Iran. The OTC residue was measured using high performance liquid chromatography (HPLC). Data analysis was performed with SPSS (V.18) (mean and standard deviation), and Man-Whitney test was employed for statistical analysis. Results: The results revealed that OTC residue were 389 to 641 ppb in the livers and 175 to 295 ppb in the fillets, respectively. However, in 86.66% of the samples (liver and fillet) the amounts of OTC residue was found to be higher than the maximum residue limits (MRLs) in codex alimentarius commission, and 13.33% of the samples (liver and fillet) were within the standard range. Analysis of input and output data using Man-Whitney test showed significant differences in liver and fillet (P < 0.05). Conclusions: This research determined that the use of OTC must be reduced to an acceptable level in aquaculture industry. Also, antibiotic residue in rainbow trout must be controlled before their delivery to the market. Today, antibiotics are widely used for prophylactic purposes and treatment as well as for stimulating growth in livestock. There are several concerns about veterinary drug residues that exceed the maximum residue limits (MRLs) in products consumed by humans because they may cause several disorders such as carcinogenesis, teratogenic, mutagenic, and allergy (1-3). Bioaccumulation of antimicrobials in edible food sources can occur in fish, crustaceans, water, sediment, and plants (4-6). A concern for agencies regulating food safety is the development of antimicrobial resistance among potential on food-fish, as a result of antimicrobial use in aquaculture ponds (7). In the United States, it has been found that the rate of resistance to tetracycline products has increased from 2% in 1950 to 80% in 1998. Nevertheless, in 1997, the center for diseases control and prevention (CDC) reported that 50% of antibiotics were consumed for nonmedical benefits (8). The study of Darwish et al. (2013) on antibiotic residues in food in African countries found that 41.17% of samples had higher OTC residue levels in their foods than the standard level (9). Also, Barani and Fallah (2014) studied tetracycline residues in 138 rainbow trout samples and found that tetracycline was about 1.43 - 101.4 ppb in 63.1% of the samples. Therefore, tetracycline residues in all the samples were not higher than the MRL levels based on institute of standard and industrial research of Iran (ISIRI) (200 ppb) (10, 11). In another research, Baydan et al. (2015) studied OTC residues in some samples of the fish in the sediment and sea water and found no oxytetracycline residues higher than the standard level in the samples (12). Oxytetracycline, a broad-spectrum antibiotic discovered in 1940s, is active against a wide variety of bacteria (13). This antibiotic is widely used in aquaculture industry because of its wide range of application and low price (14). This drug is administered to fish for the prevention and treatment of bacterial diseases such as ulcer, furunculosis, red moth ulcer, etc. The mechanism of its effect is done through the connection to ribosome and control of bacterial protein synthesis (15). The Iranian veterinary organization general department states the standard dose of oxytetracycline to be 200 ppb in the fillet and 600 ppb in the liver of rainbow trout based on codex alimentarius commission (16) and ISIRI (11). Also, FAO (17), FDA, and EPA (18) levels relating to safety attributes of fish products published in regulations and guidance for oxytetracycline levels are presented in Table 1. In many developing countries including Iran, there is currently no national plan to evaluate the residue of products from aquaculture ponds despite the antibiotic overdosing in that industry (19). With the increasing human consumption of aquaculture products, the probability of exposure to potentially occurring antimicrobial resistant bacteria, resistance genes, or antimicrobial residues in seafood is increasing. Therefore, the residue antibiotic in the fish tissues has reduced the quality of fish food. Today, high performance liquid chromatography (HPLC) is a simple and sensitive technique for determining antibiotic residues in various products (20, 21). This study aimed at measuring OTC residue using HPLC in the tissue of rainbow trout from great aquaculture ponds in Hamadan province, West of Iran. City of Nahavand is located in the Southwestern side of Hamadan province. There are several permanent, seasonal spas, and springs throughout this area and some important of which are Farsban spa, with a water discharge of 1.5 m3/s, and Gamasiab spa (the largest spring in Iran), with a water discharge of 5m³/s and an average temperature of 5°C. Large aquaculture ponds have been placed near these two spas. A total of 45 rainbow trout were randomly extracted from 15 aquaculture ponds during fall. The mean weight of the samples was 600 ± 50 g and they were of the same age (7 months). Each sample was appropriately packaged and placed in a cold box, transported to the laboratory, and kept in a freezer (-20°C) prior to the analysis (9). In the preparation phase, the samples (25 g of fillet per fish) were first weighed using a Sartorius digital scale (precision rate: 0.0001; made in Germany) (15). Then, to homogenize the fish’s tissue, the samples were treated uniformly by a mixer for 2 minutes. Two grams were extracted from this mixture and 0.1 g citric acid, 1 mL nitric acid 30%, 4 mL methanol (HPLC grade), and 1 mL deionized water were added. Afterwards, each sample was placed in an ultrasonic bath for 15 minutes and then centrifuged (4000 rpm) for 10 minutes (21). The supernatant was filtered with 0.45 μm. To measure oxytetracycline residue, 20 μL of the prepared sample was injected into the HPLC device (Model: Waters, US). The mobile phase included methanol (HPLC grade) and acetonitrile (0.01 M with ratio 1:1.5:2.5v/v with a flow rate of 1.5 mL/min) at a temperature of 25°C, and the isolation phase was done using Nuclosil (100) - C-18 inverse column with specifications (250 mm × 4.6 mm i.d., 5 μm, Germany) and UV-VIS detector at wavelength 360 nm (15, 21). Three replicates of each analysis were performed and the result was taken as the average value of the experiment. All materials were of analytical grade and purchased from Merck Company. We analyzed laboratory and instrumental blanks throughout the experiment and found no sign of interference or contamination in the samples. Spiked matrixes recoveries were computed and found to be greater than 90%. Oxytetracycline hydrochloride of the analytical grade was bought from Sigma Company and utilized to draw the calibration curve. 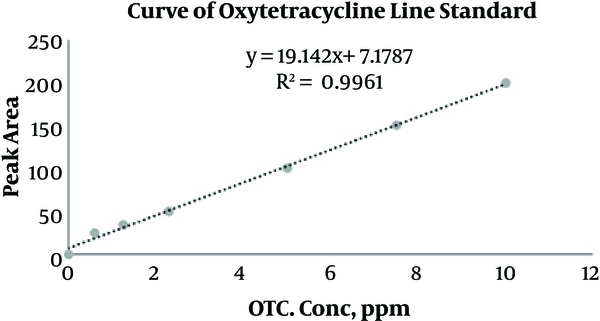 With an injection of the standard solution, oxytetracycline was prepared with concentration rates of (0.25, 0.5, 1, 2.5, 5, and 10 mg/L) in a 10-mL volumetric flask so that the calibration curve was derived in peak areas. The derived line equation is as follows: y = 19.142x + 7.1787, where y denotes peak area and x is concentration of oxytetracycline (mg/L). The correlation coefficient was acquired (R2 = 0.9961), and this signified the linearity of the equation (Figure 1). The indicated limit of OTC in 0.05 mg/L was derived when the mean time was derived for the period of oxytetracycline inertia with the range of 4.9 to 5 minutes. 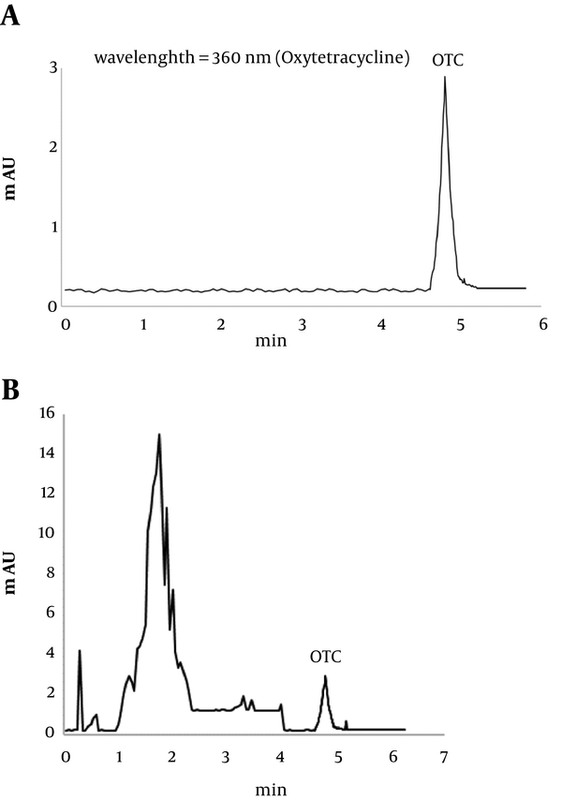 Figure 2A and 2B show chromatograms of oxytetracycline: (A) standard OTC and (B) OTC residue in a sample of rainbow trout. The data were analyzed by statistical package for the social science (SPSS) software, V.22.0. P value was calculated using analytical Man-Whitney test and value less than 0.05 was considered as significant. Nonparametric tests are basically used to overcome the underlying assumption of normality in parametric tests. The values of each parameter were compared to standard regulations. Table 2 displays the results of measurements of OTC residue in the livers and fillets of cultured rainbow trout. OTC residue was found in all samples. The mean value and standard deviation in sample No. 36 in pond No. 12 (295 ± 0.062 ppb for fillet) and sample No. 20 in pond No. 7 (641 ± 0.013 ppb for liver) were higher than other samples, while the lowest values of mean and standard deviation of OTC residue were found in sample No. 10 from pond No. 4 (175 ± 0.021 ppb for fillet) and sample No. 11 in pond No. 4 (389 ± 0.041 ppb for liver). Similarly, the results indicated that the (OTC) residue level was higher than MRL in 86.66% of the samples (liver and fillet), while 13.33% of the samples were within the standard level. Man-Whitney test (Table 3) was used for statistical analysis at confidence level of P < 0.05. The results of the statistical analysis revealed a significant difference among the rates of oxytetracycline residue in the liver and fillet samples of the rainbow trout. The use of antibacterial agents in food products with animal origins has created major concerns in advanced countries (22). In many European and American countries such as Canada and Norway, only a few antibiotics are used in aquatic ecosystems. In Canada, the verified antibiotics used in aquaculture ponds, include oxytetracycline, sulfadiazine (trimethoprim), and sulfadimethoxine (ormetorpim). Tetracycline and sulfonamide are widely used in the United States within aquaculture ponds to treat fish infections (23) and HPLC is employed as an analytical method with high sensitivity and accuracy to evaluate drug residue (21). The study of Olatoye and Basiru (24) on oxytetracycline residue in catfish indicated that antibiotic residue was observed in the livers (61.3%) and fillets (52.5%) of catfish. The mean of of oxytetracycline residue derived from catfish liver samples was 875.32 ± 45 ppb and that of the fillets was 257.2 ± 133 ppb. Therefore, the rates of residue in the livers (26.9%) and fillets (18.8%) were higher than the standard level. Similar to the investigation of Olatoye and Basiru (24), oxytetracycline residue was found in the fillets from the sampled fish in the present study. According to studies conducted on bacterial resistance in fish, resistant genes originated from the antibiotic-resistant excrement bacteria in wastewaters, which are discharged to rivers and finally to wetlands, and they were the reason for transferring such a resistance to the flora of regions in the Mediterranean sea (25). In another study, Barani and Fallah (2014) studied tetracycline residues in 138 rainbow trout samples. They found a high occurrence of tetracycline in rainbow trout samples obtained from Iranian aquaculture. However, the residues of tetracycline in samples were not higher than the MRLs by the ISIRI (10, 11). Nonetheless, the high level of tetracycline could be a potential hazard to the public health. In 2012, Fadaeifard investigated another antibiotic, fluoroquinolones, in rainbow trout samples from aquaculture ponds in Chaharmahal-va-Bakhtiari province of Iran (26). He found that none of the samples had any antibiotics higher than the ISIRI (11) recommendation. Several studies have investigated the multiple antibiotic resistances to some antibiotics such as ampicillin, tetracycline, streptomycin, and chloramphenicol in the pathogens of existing fish and bacteria in the aquatic ecosystem, which is generally caused by certain drugs. Evidence has also reported multiple antibiotic resistances from aquatic ecosystem in the West of the Mediterranean Sea (27). Antibiotic residues significantly affect microbiological results and may create false results; thus, if there are some antibiotic residues in consumed fish, this product cannot be considered free of any microbial pollution by relying on microbiologic experiments nor be recommended for use. Therefore, it is necessary to remove antibiotic residues from the consumed residues to confirm results from microbiological findings (28). The results of the current study and the percentage of pollution indicate that samples, which have been screened by means of microbiological techniques, should be gathered via execution of a general project throughout the country. By collecting adequate samples from aquaculture ponds in several provinces considering the expense of HPLC, positive cases should be detected by HPLC. Then, considering the results of the project and the percentage of pollution, a surveying project should be executed and the antibiotic residues be controlled by employing a proper plan and through determination of the required samples throughout the country (19). Despite antibiotic overdosing, accurate healthcare supervision, and control for the relevant regulation about antibiotics in most countries, due to some reasons such as legal gap, ambiguous behavior with law-breakers, treatment with polluted products, absence of professional officials, lack of a national MRL, lack of diagnostic laboratories for veterinary drug residues, and absence of the relevant experts this trend may seriously endanger the health of the users (28, 29). The subject of drug residue in aquatic ecosystem with respect to bacterial resistance has been less explored in Iran. As for livestock, a regular and permitted plan should be formulated for the use of drugs in aquaculture ponds. The time interval between omission of antibiotic and consumption of products from aquaculture ponds should be considered. A treatment period of either less or more than the recommended time may lead to failure of therapy and/or occurrence of the afore-mentioned disorders. The rate of omission of antibiotics from the tissue of fish varies significantly depending on water temperature. The exclusive period for dieting from drug use before the withdrawal time also depends on type of drug (30). To prevent harmful residues, governmental agencies should establish required withdrawal periods (withdrawal periods for fish 25 days at 20°C (8, 31)). The time needed to reduce the concentration of OTC when drug residue is higher than MRL before entering the consumer market has been determined to be 37 days in the Mediterranean order (32). Some important strategies for handling this problem include awareness of the range of effect, drug composed dose and prescription, high quality water usage, reduced stress, the consumption of appropriate rations, antimicrobial drug use as prescribed by a veterinarian and controlled by a regulatory and scientific system, and the use of suitable antiseptics (33). Vaccination is recommended as the most effective method in the treatment and prevention of disease, particularly upon occurrence of multiple resistances. Likewise, a series of exclusive antimicrobial drugs could be produced by means of modern techniques and reduced production, release, and transfer of resistant bacteria by conducting a series of studies (34). To reduce the negative effect of antibiotics, appropriate strategies must be used based on scientific evidence. It is recommended to take such drugs properly and rationally; therefore, intersectoral cooperation and further studies are suggested. The present study investigated OTC in aquaculture rainbow trout. The results revealed that in 86.66% of the samples (liver and fillet), the amount of OTC residue was found to be higher than the maximum residue limits (MRLs) in codex alimentarius commission and the ISIRI (2011); and this is alarming as a potential hazard for public health. Therefore, some limitations must be considered for aquaculture industry in Iran. On the whole the followings are suggested: approving laws, procedures and executive instructions for veterinary drug residues; compelling officials in aquaculture ponds to record date and type of drug(s) prescribed by veterinarians; establishing laboratories for diagnosing veterinarian drug residues at province centers; establishing a national reference laboratory and uniformity of the used synthesis standards; and techniques. The authors of this essay express their sincere gratitude to Dr. Amir Abbas Rafati, a professor in the field of chemistry-physics from Hamadan University of Bu-Ali (Avicenna), for his kind cooperation in this investigation. The authors also would like to thank the Deputy of Research, Tehran University of Medical Sciences for financial support of this research (Grant no: 35870). Authors’ Contribution: Lida Rafati and Seyed Mojtaba Momtaz: manuscript preparation; Lida Rafati and Sahar Shirazi: the research project; Amir Hossein Mahvi and Mohamad Hassan Ehrampoush: developing the study idea, scientific advisor; Aria Sohrabi and Mehdi Mokhtari: technical advisor; Lida Rafati: data analyzer, performing experimental work, abstracted data; Sahar Shirazi: cooperation in doing field work and data collection. Funding/Support: This study was financially supported by Shahid Sadoughi University of Medical Sciences, Yazd, Iran. 1. Boonthai T, Khaopong W, Sangsong J, Nimrat S, Vuthiphandchai V. Effect of antibiotic supplementation on the quality of cryopreserved fish sperm of silver barb (Barbodes gonionotus): Sperm motility and viability, bacterial quality and fertilization. Anim Reprod Sci. 2016;166:36-46. doi: 10.1016/j.anireprosci.2016.01.002. [PubMed: 26786020]. 2. Slana M, Dolenc MS. Environmental Risk Assessment of antimicrobials applied in veterinary medicine-A field study and laboratory approach. Environ Toxicol Pharmacol. 2013;35(1):131-41. doi: 10.1016/j.etap.2012.11.017. [PubMed: 23274419]. 3. Aarestrup FM, Wegener HC, Collignon P. Resistance in bacteria of the food chain: epidemiology and control strategies. Expert Rev Anti Infect Ther. 2008;6(5):733-50. doi: 10.1586/14787210.6.5.733. [PubMed: 18847409]. 4. Delepee R, Pouliquen H, Le Bris H. The bryophyte Fontinalis antipyretica Hedw. bioaccumulates oxytetracycline, flumequine and oxolinic acid in the freshwater environment. Sci Total Environ. 2004;322(1-3):243-53. doi: 10.1016/j.scitotenv.2003.09.018. [PubMed: 15081752]. 5. Bebak-Williams J, Bullock G, Carson MC. Oxytetracycline residues in a freshwater recirculating system. Aquaculture. 2002;205(3-4):221-30. doi: 10.1016/s0044-8486(01)00690-1. 6. Migliore L, Cozzolino S, Fiori M. Phytotoxicity to and uptake of enrofloxacin in crop plants. Chemosphere. 2003;52(7):1233-44. doi: 10.1016/S0045-6535(03)00272-8. [PubMed: 12821004]. 7. Heuer OE, Kruse H, Grave K, Collignon P, Karunasagar I, Angulo FJ. Human health consequences of use of antimicrobial agents in aquaculture. Clin Infect Dis. 2009;49(8):1248-53. doi: 10.1086/605667. [PubMed: 19772389]. 8. Prescott JF, Dowling PM. Antimicrobial therapy in veterinary medicine. John Wiley & Sons; 2013. 9. Darwish WS, Eldaly EA, El-Abbasy MT, Ikenaka Y, Nakayama S, Ishizuka M. Antibiotic residues in food: the African scenario. Jpn J Vet Res. 2013;61 Suppl:S13-22. [PubMed: 23631148]. 10. Institute of Standard and Industrial Research of Iran (ISIRI). Maximum Residue Limits for Veterinary Drugs in Foods. National Standard No. 11101. Tehran; 2011. 11. Barani A, Fallah AA. Occurrence of tetracyclines, sulfonamides, fluoroquinolones and florfenicol in farmed rainbow trout in Iran. Food Agric Immunol. 2014;26(3):420-9. doi: 10.1080/09540105.2014.950199. 12. Baydan E, Kaya B. Investigation of some veterinary drug residues in sea water, sediment, and wild fishes captured around fish farms in the Aegean Sea: Oxytetracyline, ivermectin and emamectin. Ankara Universitesi Veteriner Fakultesi Dergisi. 2015;62(3):171-6. doi: 10.1501/Vetfak_0000002676. 13. Chopra I, Roberts M. Tetracycline antibiotics: mode of action, applications, molecular biology, and epidemiology of bacterial resistance. Microbiol Mol Biol Rev. 2001;65(2):232-60. second page, table of contents. doi: 10.1128/MMBR.65.2.232-260.2001. [PubMed: 11381101]. 14. Long AR, Hsieh LC, Malbrough MS, Short CR, Barker SA. Matrix solid-phase dispersion (MSPD) isolation and liquid chromatographic determination of oxytetracycline, tetracycline, and chlortetracycline in milk. J Assoc Official Analytic Chem. 1989;73(3):379-84. 15. Senyuva HZ, Ozden T, Sarica DY. High-performance liquid chromatographic determination of oxytetracycline residue in cured meat products. Turk J Chem. 2000;24(4):395-400. 16. Codex Alimentarius Commission. FAO and WHO: Maximum residue limits for veterinary drugs in foods. Updated as at the 34th session of the Codex Alimentarius Commission. 2013. Available from: http://www.codexalimentarius.net/vetdrugs/data/index.html. 17. Food and Agriculture Organization of the United Nations. Fisheries and aquaculture department statistics. 2015. 18. U.S. Department of Health and Human Services Food. Applied Nutrition Fish and Fishery Products Hazards and Controls Guidance. APPENDIX 5: FDA and EPA Safety Levels in Regulations and Guidance. Drug Administration Center for Food Safety; 2011. 19. Sharafati-Chaleshtori R, Mardani G, Rafieian-Kopaei M, Sharafati-Chaleshtori A, Drees F. Residues of oxytetracycline in cultured rainbow trout. Pak J Biol Sci. 2013;16(21):1419-22. [PubMed: 24511760]. 20. Khosrokhavar R, Hosseini MJ, Amini M, Pirali-Hamedani M, Ghazi-Khansari M, Bakhtiarian A. Validation of an Analytical Methodology for Determination of Oxytetracycline Residue in Milk by HPLC with UV Detection. Toxicol Mech Methods. 2008;18(4):351-4. doi: 10.1080/15376510701610984. [PubMed: 20020901]. 21. Kowalski C, Pomorska M. Rapid and validated HPLC assay for the determination of oxytetracycline in biological material. Bull Vet Inst Pulawy. 2007;51(3):397. 22. Pathak SP, Gopal K. Occurrence of antibiotic and metal resistance in bacteria from organs of river fish. Environ Res. 2005;98(1):100-3. doi: 10.1016/j.envres.2004.05.012. [PubMed: 15721889]. 23. Romero-Gonzalez R, Lopez-Martinez JC, Gomez-Milan E, Garrido-Frenich A, Martinez-Vidal JL. Simultaneous determination of selected veterinary antibiotics in gilthead seabream (Sparus Aurata) by liquid chromatography-mass spectrometry. J Chromatogr B Analyt Technol Biomed Life Sci. 2007;857(1):142-8. doi: 10.1016/j.jchromb.2007.07.011. [PubMed: 17644050]. 24. Olatoye IO, Basiru A. Antibiotic usage and oxytetracycline residue in African catfish (Clarias gariepinus) in Ibadan, Nigeria. World J Fish Marine Sci. 2013;5(3):302-9. 25. Matyar F, Dincer S, Kaya A, Colak O. Prevalence and resistance to antibiotics in Gram negative bacteria isolated from retail fish in Turkey. Ann Microbiol. 2004;54:151-60. 26. Fadaeifard F. Determination of enrofloxacin residue in the muscle and liver of cultured rainbow trout in chaharmahal-va-bakhtiary province by elisa. J Food Hygiene. 2012;2(5):53–62. 27. Pathak SP, Bhattacherjee JW, Ray PK. Seasonal variation in survival and antibiotic resistance among various bacterial populations in a tropical river. J General Appl Microbiol. 1993;39(1):47-56. doi: 10.2323/jgam.39.47. 28. Chafer-Pericas C, Maquieira A, Puchades R, Company B, Miralles J, Moreno A. Multiresidue determination of antibiotics in aquaculture fish samples by HPLC-MS/MS. Aquac Res. 2010;41(9):e217-25. doi: 10.1111/j.1365-2109.2010.02504.x. 29. McEwen SA, Fedorka-Cray PJ. Antimicrobial use and resistance in animals. Clin Infect Dis. 2002;34 Suppl 3:S93-S106. doi: 10.1086/340246. [PubMed: 11988879]. 30. Farahmand S, Rahim M, Salehzadeh A, Rokni N, Golchinefar F. Oxytetracycline Residue in Chicken Tissues from Tehran Slaughterhouses in Iran. Pak J Nutr. 2006;5(4):377-81. doi: 10.3923/pjn.2006.377.381. 31. Kessler DA, Vladeck DC. A critical examination of the FDA's efforts to preempt failure-to-warn claims. Geo LJ. 2007;96:461. 32. Kozak GK, Boerlin P, Janecko N, Reid-Smith RJ, Jardine C. Antimicrobial resistance in Escherichia coli isolates from swine and wild small mammals in the proximity of swine farms and in natural environments in Ontario, Canada. Appl Environ Microbiol. 2009;75(3):559-66. doi: 10.1128/AEM.01821-08. [PubMed: 19047381]. 33. Andersson AM, Skakkebaek NE. Exposure to exogenous estrogens in food: possible impact on human development and health. Eur J Endocrinol. 1999;140(6):477-85. 34. Al-Mustafa ZH, Al-Ghamdi MS. Use of norfloxacin in poultry production in the eastern province of Saudi Arabia and its possible impact on public health. Int J Environ Health Res. 2000;10(4):291-9. doi: 10.1080/0960312002001483. [PubMed: 11260778].